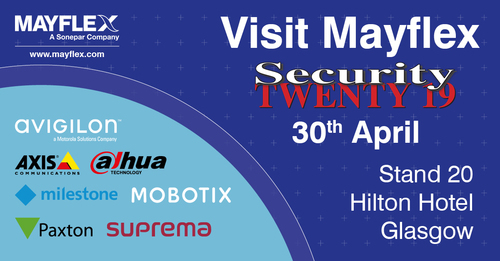 March 2019, Mayflex the distributor of Converged IP Solutions is attending the Security Twenty 19 event in Glasgow on the 30th April. These conferences are aimed at key purchasers and people who specify security products and provides updates for attendees on the latest developments in the security industry. Mayflex will be showcasing its converged IP solutions which incorporate security, infrastructure and networking solutions. Representatives from the converged sales teams will be available to provide knowledge and expertise which includes advice and support with product selection and system design to cover all elements of a project no matter the size. Register to attend Security Twenty 19 and visit Mayflex on stand number 20. Brands distributed by Mayflex include; Avigilon, Axis, Dahua, Fluidmesh, Milestone, MOBOTIX, Paxton, Raytec, Razberi, STP, Suprema, Veracity and Wavestore.